It's been a long and winding road to The Dark Tower, for audiences and the characters journeying to the legendary locale, but the end is in sight. Shooting on the first film in a proposed series kicked off earlier this year. A few weeks back a bunch of set photos hit the web, showing off the landscapes and scenery, and we've now got our first look at the man leading the Stephen King adaptation. 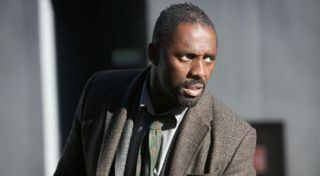 Ladies and gentlemen, I give you: Idris Elba. As Roland Deschain, aka The Gunslinger, Elba really looks the part. That first snap shows him decked out in faded jeans, a white shirt, a waistcoat, scarf and pair of boots which is how Deschain is described in most of the novels. But it's the long, dark overcoat in the second shot that's the cherry on top. Together with his holstered six-shooters, it's like he was born to play the role.